at National University in Sacramento, CA. discusses her latest book, The Anger Workbook for Women. Laura Petracek, Ph.D., LCSW, is assistant professor of clinical psychology at National University in Sacramento, CA. She maintains a private practice in San Francisco. Dr. Petracek's new book, The Anger Workbook for Women: How to Keep Your Anger from Undermining Your Self-Esteem, Your Emotional Balance, and Your Relationships. 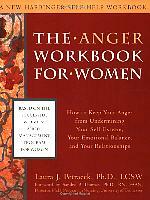 This workbook addresses the unique concerns of women with anger problems. Dr. Petracek says, "Rigid social patterning conditions many women to stifle or deny their anger, and this repression can cause a range of other psychological problems. Others experience violent, outwardly focused anger." Whichever pattern your anger follows, this book provides a powerful set of anger management tools. Cognitive behavioral and attitude adjustment exercises help you limit the power of anger-triggering situations. Worksheets and assessments guide you in an examination of family-of-origin issues that might contribute to your problems with anger. Sections of the workbook explore the connection between anger and substance abuse, mood disorders, and spirituality, as well as the issue of domestic violence. Evaluate the motive you have for expressing anger or rage. You may think you are expressing anger when, in fact, you are attempting to control or change another person. Abuse usually begins as emotional abuse. By that we mean we attempt to change or control others through the use of words or actions that are not physically damaging. When that form of abuse begins to lose its effectiveness, we attempt to change or control others through physical means. Usually, the physical abuse begins, as did the emotional, in a small way and increases over time. Sexual abuse, like the other forms of abuse, begins in a small way and increases over time into a larger problem. Do you think you may have a problem with anger? An interesting article about anger: When You're Angry, Let It Show!